WINONA LAKE — Indiana basketball legend Kent Benson’s public speaking career got off to a pretty underwhelming start. A Mr. Basketball award, a storied college career at Indiana University and a 12-year professional basketball stint later, and it’s become a second vocation for the New Castle native. 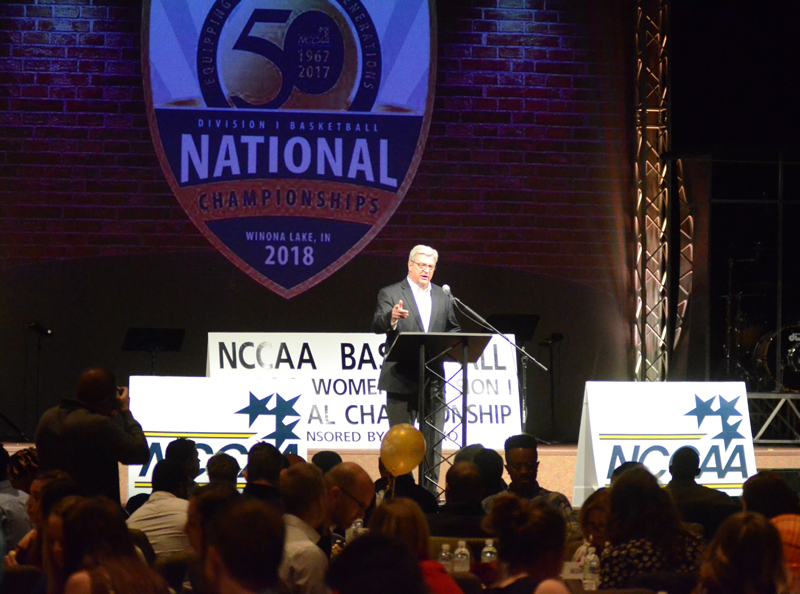 Benson delivered the keynote address at Tuesday’s National Christian College Athletic Association National Basketball Championship Banquet at Warsaw Community Church celebrating the 50th year of the tournament, taking place at Grace College this week. When he thought back to his first speaking engagement all those years ago, he chuckled at the change in fortunes. Back then, of course, Benson’s focus was on the game of basketball. He went on to become one of the greatest Indiana players to ever grace the hardwood. Named Indiana Basketball in 1973, Benson played for IU from 1973-77 and in ’76 helped the Hoosiers complete a perfect, 32-0 national championship season, the last time any team has accomplished the feat. He was selected as Most Outstanding Player at that 1976 NCAA Tournament and ultimately ended his collegiate career as the Hoosiers’ eighth all-time leading scorer with 1,740 points and a total of 1,031 rebounds, making him one of just three IU players to eclipse the 1,000-carom mark. The number one NBA draft pick in 1977, Benson played 11 seasons in the league, first with the Milwaukee Bucks and then later with the Detroit Pistons, Utah Jazz and Cleveland Cavaliers. Attendees to Tuesday’s banquet mill about the lobby at Warsaw Community Church prior to the NCCAA banquet. After inviting attendees to pray with him, Benson began Tuesday’s address with a Bible reading from Ecclesiastes 9:10: “Whatever thy hand finds to do, do it with all thy might” encouraging the players in attendance to give their all in pursuit of excellence. He relayed the life-changing advice he’d been given years ago in his eighth grade study hall by monitor and athletic trainer “Pink” Worthington on exactly how to go about that pursuit, breaking it down into the “Six Ds” of desire, determination, dedication, discipline, direction and decision. But much of Benson’s speech at Warsaw Community Church was devoted to how players should conduct themselves beyond the game of basketball. Eyes are on you, he told the players at Tuesday’s gathering, and looking to you as an example. “Yeah, basketball is an important game, but the most important game that you play is the game of life. And you as tremendous athletes have an awesome responsibility to use your God-given talents and abilities to glorify God,” he said. As it turns out, Benson bears two connections to the Warsaw community. A former IU teammate, Tom Abernethy’s son Matt played for Grace College from 2000 to 2003 and is currently ranked sixth on the program’s all-time scoring list. 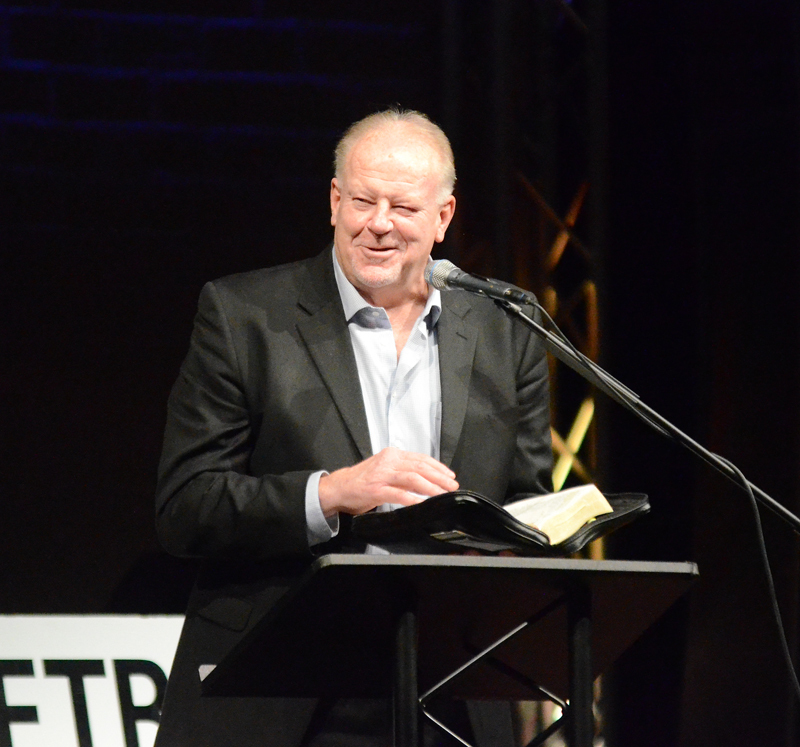 But it was his second connection to the area, his friendship with 1st Source Bank of Warsaw Vice President John Elliott, that brought him to deliver Tuesday’s keynote address. “A long time, great friend of mine, John Elliott, who is with 1st Source Bank here in Warsaw, our daughters played together in AAU back several years ago when they were 15 and went undefeated and won a national championship. So we had an opportunity to really develop a friendship, and I’ve been up here several times to Warsaw, know about Grace and really appreciate what they do here with their athletes and the development of the Christian atmosphere. It’s just really a great opportunity for these kids,” Benson said. 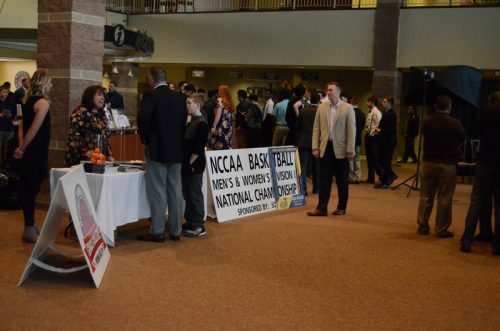 Tuesday’s banquet celebrated 50 years of the NCCAA National Championship Tournament and marks roughly a decade of hosting for Grace, which became the site for the women’s tournament in 2009 and began hosting both the men’s and women’s championships in 2012. The 16 men’s and women’s teams invited to the tournament attended Tuesday’s banquet, as well as a who’s-who in the Warsaw area, with mayor Dr. Joseph Thallemer welcoming athletes and coaches to the city and Kosciusko County Visitors Bureau’s Tina Keaffaber inviting attendees to enjoy the Rabb Water Systems bottled water and K&K Soy Products chap stick that was left for them on their tables. 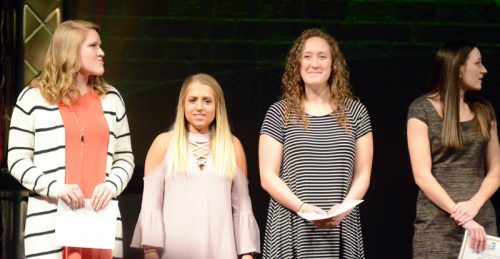 Grace College women’s basketball players Brooke Sugg, center-left, and Pam Miller, center-right, are honored as NCAA basketball scholar-athlete awards were presented. After the meal, team introductions were made and NCCAA awards were announced with Grace’s own Pam Miller and Brooke Sugg winning scholar-athlete awards. Kari Borowiak of Concordia was named the association’s Kathy Freese Award-winner, while on the men’s side, Dallas Baptist University’s Patrick Burke was selected for the Pete Maravich Award. The men’s tournament will continue through the championship at 5 p.m. Saturday, following the women’s title game scheduled for 2 p.m. at Manahan Orthopaedic Capital Center. The fourth-seeded Lady Lancers’ title bid begins today at 5:15 p.m. opposite No. 5 seed Emmanuel. Warsaw Mayor Dr. Joseph Thallemer welcomes teams to the city Tuesday.